Lately the DNS topic was addressed here, I'm happy to get back to you with more on this. Hope you will find more detailed description of usage of DNS in EPC. The below is detailed description of, I think, most important from the DNS topic with examples of dns zone files. UPDATE: For more info on how the EPC uses the DNS please refer to DNS in LTE label. Both <mnc-val> and <mcc-val> are 3 digits long. If the MNC of the PLM is 2 digits, then a zero shall be added at the beginning. 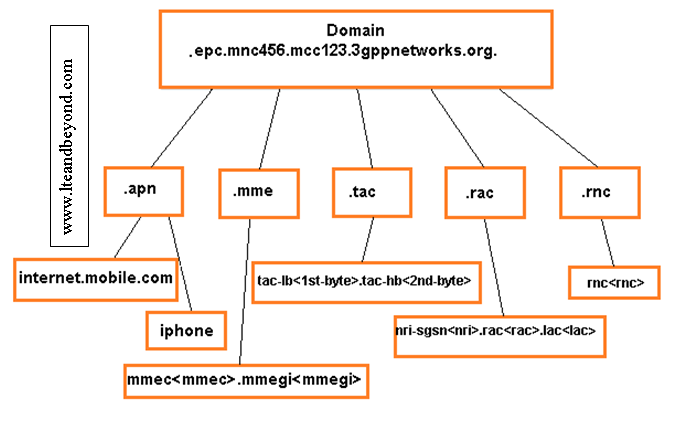 The Home Network Domain name of an IMSI can be derived by taking the first 5 or 6 digits (depending on whether a 2 or 3 digit mnc is used), use the MNC and MNC values derived to form the domain name, add the label epc at the beginning of the domain name. For example an IMSI 1234560123456789 has an MSIN 0123456789 and a Home network domain name of epc.mnc456.mcc123.3gppnetworks.org. APN Network Identifier (APN-NI) - Basically it's the APN name, from UE point of view. Or just the rest what is left from APN-FQDN when you remove the APN (-NI) from it. APN Network Identifier (APN-NI) - Basiclly it's the APN name, from UE point of view. Whenever configuring the DNS, no matter if this is the one you will used by any Operator in EPC deployment you are doing or just for yourself, dont forget the dots "." they are freaking important. In many situations it's desirable to select a collocated node rather than non-collocated, or a topologically closer rather than topologically further node. Because of this feature/requirement to allow DNS client to perform a comparison which one of the nodes is topologically closer (or same "distance"), the 3GPP standards proposed the "canonical node name". The first label is either ‘topon’ or ‘topoff’ to indicate whether or not collocated and topologically close node selection shall be preferred. Both topon and topoff are an indication to skip in the comparison the <single-label-interface-name> in order to obtain the canonical-node-name. Topoff, contrary to topon, indicates that when selection is based on topology, that those entries should be ignored. Both topon and topoff can be used with topology and collocation gw-selection mode. <Single-label-interface-name> is a label identifying the interface type (e.g. : s5, s8 …). This label is not considered (thanks to topon preceding) so that only canonical node names are compared. A node shall have exactly one canonical node name. When comparing the host name FQDN to find out whether the nodes are actually the same, the first two labels of the host name FQDN shall be ignored. When using canonical host names with ‘topon’ as first label, it is crucial to use canonical node names, which are hierarchically structured to reflect such topological closeness of nodes so that the DNS client can make the appropriate decision. The higher the number of labels in the common suffix will indicate the closer the nodes are. In other words, we will make the assumption that the node name structure has been selected so that two topologically closest nodes are those with the longest matching suffix in their respective canonical node names. Let make an assumption that an Operator has 2 sites, called "north" and "south". Each site has 5 combined S-GW/PDN-GW nodes. The "north" site has these combined S-GW and PDN-GW nodes named node01-node05, and the "south" site has combined S-GW and PDN-GW nodes named node06-node10. During an attach procedure, MME performs the S-NAPTR look-ups for both the PGW and SGW, as described in PGW and SGW selection, and then sorts the list of gateway pairs. These collocated gateway pairs are therefore given the highest priority. The pairs will be sorted by the longest matching parts in the canonical node name. The label topoff means that there is no topological structure present, and therefore, they follow the priority order received from the DNS. The list consists of all possible pair combinations. For example, with 10 SGWs and 10 PGWs, there are 100 possible pairs. Selection of collocated nodes is ‘always’ highest priority for selection regardless if the FQDN contains “topon” or “topoff. Thanks Dudi, I will look into it.